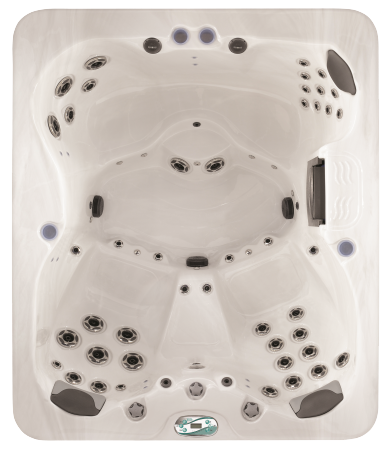 The Vita Spa Joli available from Bay Spas is the best selling Vita Spas hot tub, suitable for up to 4 people, this best selling 4 seat hot tubs features 42 jets plus an additional 10 air outlets for the full experience of a powerful hot tub. Complete with a range of features from LED cup holders and LED fountains to underwater LED lights, the Vita Joli is economical to run, easy to maintain and a pleasure to use. Designed to seat 4 adults with 2 deep reclining seats, comfort is the key element to the Vita Joli. It is designed to be easy to use with a range of modern features from the MP3 music system with it's own sub woofer and the M7 heating system, there are also topside programmable controls so that there is no need to leave your hot tub apart from to get a new bottle of champagne! For more information on ordering the best selling Vita Joli 4 seat hot tubs in the South West, call Bay Spas for a no obligation quote and more information on ordering, delivery and our installation service as well as hot tub chemicals and consumables.